The Aurora is a classic. 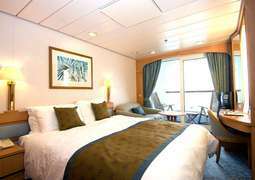 Christened in April 2000 by Her Royal Highness, The Princess Royal in Southampton, this ship is one of P&O’s finest vessels with an elegant tiered stern and long bow. A signature feature of the Aurora is her water feature which forms the centerpiece of her atrium. 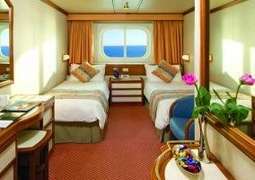 It received a new livery design by P&O in winter of 2015 as part of a 26 million pound makeover. 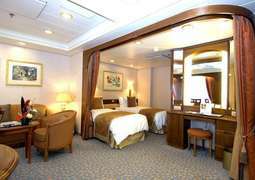 Not only does the exterior of the ship have a new-look design, but the ship has also had a complete interior overhaul. From a range of bars to a cinema, a theatre and three swimming pools, the Aurora has something for all of the family. The Aurora graces the water of a number of destinations including the , the USA and Canada. 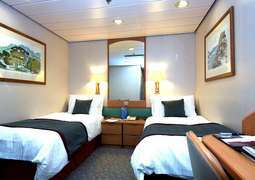 Accommodation on board the Aurora is cosy and comfortable with a choice of different kinds of cabins, perfect for any passenger. Suites provide a lounge for you to relax in, a whirlpool bath and a private balcony complete with chairs and a table. You will feel at home in your cabin with all the amenities you need to create a homely feel, in a spacious and welcoming atmosphere. The two main restaurants on board are the Alexandria and Medina and they embrace P&O's traditional connections with North Africa and the Middle East, providing a sophisticated dining experience. The Horizon Restaurant is the perfect place to enjoy English breakfasts, afternoon tea and themed dinners with a spectacular sea view. For those who enjoy fine wine and food The Glass House will provide you a relaxed haven to enjoy the many types of wine in the cellar and the meals matched with it by the resident expert. The entertainment aboard the Aurora includes a selection of lounges and bars, a nightclub, a cinema and a theatre. The different bars, like Champion's, Charlie's and Raffles, offer all kinds of entertainment as well as a great view of the sea and a perfect place to socialise with friends and family. The Playhouse is the centre of entertainment on board with new release films being screened, classical recitals and lectures during your cruise. While parents relax, the Kids’ clubs give younger passengers a place to enjoy themselves. The pools on board are perfect for everyone, from the family pool allowing children to enjoy a splash to the Crystal Pool, which is covered by the clear glass Skydome and has a poolside bar for a fresh cocktail. A massage in the Oasis Spa gives you the chance to de-stress and let go of everyday worries, while the fitness centre presents the opportunity to keep fit and healthy. Aboard the Aurora, casual attire is recommended but for dinner more formal clothing is advisable. On the Aurora you are spoilt for choice in what food you decide to eat. There are a number of restaurants including The Alexandria Restaurant which showcases world class cuisine in an Egyptian style setting, Sindhu which showcases a fusion of Indian and British cuisine and The Glass House where every course will come with the option of a different glass of wine, matched by the expert Olly Smith. There are also more informal restaurants which are more suitable for families including The Beach house and the self-service Horizon restaurant. There is a huge selection of lounges and bars, a nightclub and even a cinema on board the Aurora. The cinema or `The Playhouse´ sports over 200 comfortable chairs and in addition to films, The Playhouse is also the venue for classical recitals, lectures and much more. There is a huge variety of entertainment in our bars as well as having a great view of the sea. There is also a kids club on board for children to have fun and to allow parents to relax. There are three pools for you to choose from on the Aurora. The family pools are designed with safety in mind, while the Crystal Pool is the Aurora´s Largest swimming pool with a sliding crystal glass roof which allows swimming in all types of weather. There is also a high-tech gym which has a superb range of the latest cardio and weight-training equipment. After a hard work-out why not unwind in the Oasis Spa, where you can visit the sauna and steam rooms or get the very latest in facials, manicures, massages and aromatherapy in one of our luxurious treatment rooms overlooking the sea. There really is something for everyone on the Aurora.